ارزیابی آسیب‌پذیری به‌عنوان ابزاری مدیریتی در راستای حفاظت از منابع آب‌زیرزمینی انجام می‌شود. 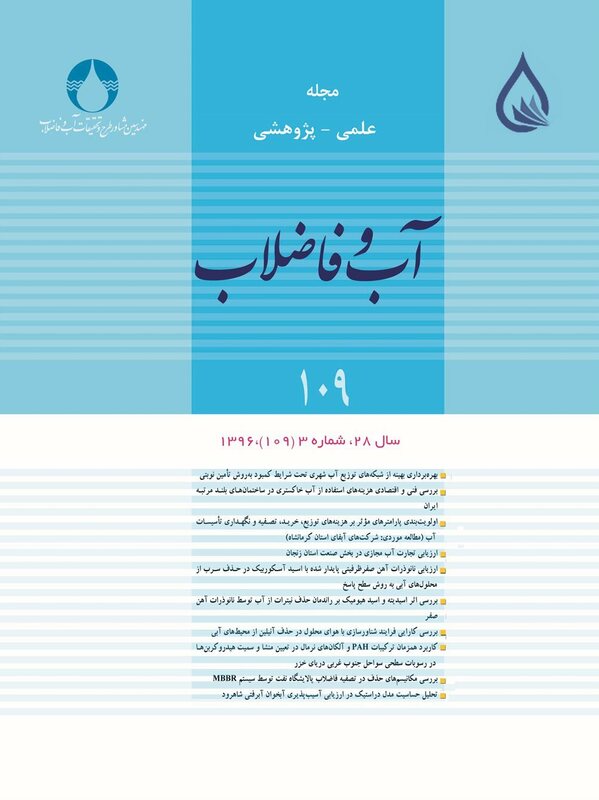 در این تحقیق آسیب‌پذیری آبخوان آبرفتی شاهرود با استفاده از مدل دراستیک که یک مدل تجربی در ارزیابی پتانسیل آلودگی سفره‌ آب زیرزمینی در مقیاس منطقه‌ای می‌باشد، بررسی شد و تحلیل حساسیت پارامترهای مدل در راستای شناخت مهم‌ترین پارامترهای تأثیرگذار بر آسیب‌پذیری انجام شد. لایه‌های اطلاعاتی مدل شامل عمق آب‌ زیرزمینی، تغذیه، محیط آبخوان، توپوگرافی، اثر منطقه غیراشباع و هدایت هیدرولیکی بر اساس تحلیل اطلاعات موجود و لایه بافت خاک سطحی بر اساس پردازش تصاویر ماهواره‌ای و تدقیق آن با نمونه‌برداری و آنالیز بافت خاک در محیط GIS تهیه و رتبه‌دهی شدند. پس از محاسبه شاخص آسیب‌پذیری، تحلیل حساسیت نقشه آسیب‌پذیری آبخوان شاهرود به دو روش حذف پارامتر و آنالیز تک پارامتری انجام شد. پس از اعمال وزن مناسب از همپوشانی لایه‌ها شاخص دراستیک بین 28 تا 148 برآورد شد. حاشیه شمالی و بخش‌هایی از جنوب غرب آبخوان، بالاترین آسیب‌پذیری را داشتند و سایر مناطق آبخوان آسیب‌پذیری متوسط تا کم را نشان دادند. مقدار پایین غلظت نیترات در مناطق کشاورزی و افزایش آن به بیش از 45 میلی‌گرم در لیتر در بخش‌های شمالی آبخوان شاهرود تأکیدی بر صحت پهنه‌بندی آسیب‌پذیری توسط مدل دراستیک می‌باشد. براساس نقشه آسیب‌پذیری آبخوان شاهرود، 6/1 درصد از مساحت سفره از پتانسیل آلودگی (آسیب‌پذیری)، بسیار بالا، 10 درصد از پتانسیل بالا، 8/28 درصد از پتانسیل آلودگی متوسط و 9/18 درصد از پتانسیل کم برخوردار بوده و مابقی (5/40 درصد) فاقد خطر آلودگی می‌باشند. Groundwater vulnerability assessment is typically accomplished as a management tool to protect groundwater resources. In this research, the DRASTIC model which is an empirical one used for evaluating the potential of an aquifer for pollution was employed to evaluate the vulnerability of Shahrood alluvial aquifer. Moreover, the sensitivity of the model paramneters was assessed to identify the ones with greatest effect on vulnerability. The model layers including depth to groundwater table level, recharge, aquifer media, topography, impact of unsaturated zone, and hydraulic conductivity were prepared and classified in the ArcGIS software based on analyses of both the available data and the layer of surface soil texture using Aster satellite images. Once the vulnerability index was calculated, the sensitivity map of Shahroud aquifer vulnerability was analyzed using the two parameter removal and single parameter sensitivity methods. These were further verified by textural analysis of soil samples from different parts of the region. The layers with appropriate weights were overlaid and the DRASTIC index of the aquifer was estimated at 28 to 148. The highest vulnerability was detected in the northern margins and southwestern parts of the aquifer while other parts were characterized by medium to low vulnerability. The low nitrogen concentration observed in the farm areas and its rise to 45 mg/l in the northern stretches of the aquifer bear witness to the accuracy of the zoning rendered by the DRASTIC model. Based on the vulnerability map of Sharoud aquifer, it was found that 1.6% of the aquifer’s area has a very high vulnerability or potential for pollution followed by 10%, 28.8%, and 18.9% of the area were identified as having high, medium and low potentials for pollution, respecytively. The remaining (i.e., 40.5%) was found to have no risk of pollution. Aller, L., Bennet, T., Leher, J. H., Petty, R. J. & Hackett, G., 1987, "DRASTIC: A standardized system for evaluating groundwater pollution potential using hydrogeological settings", EPA 600/2-87-035, 622. U. S. Environmental Protection Agency. Almasri, M. N., 2008, "Assessment of intrinsic vulnerability to contamination for Gaza coastal aquifer, Palestine", Journal of Environment Management, 88, 577-593. Asghari Moghadam, A., Fijani, A. & Nadiri, A., 2009, "Assessing vulnerability of water resources in Bazargan and Poldasht plains using DRASTIC model", Journal of Environmental Studies, 52, 55-64. Azizi, F. & Mohammadzadeh, H., 2012, "Vulnerability mapping and evaluating spatial changes in groundwater quality of Emamzadeh Jafar plian, Gachsaran, by DRASTIC and GWQI quality index", Journal of Water Resources Engineering, 5 (13), 1-16. Breaban, I. G. & Paiu, M., 2012, "Application of DRASTIC model and GIS for evaluation of aquifer vulnerability: Case Study Barlad city area", Water Resources and Wetlands, Conf. Proc., Tulcea-Romania. Evans, B. M. & Myers, W. L., 1990, "A GIS based approach to evaluating regional groundwater pollution potential with DRASTIC", Journal of Soil and Water Conservation, 45, 242-245. Gogu, R. C. & Dassargues, A., 2000, "Current trends and future challenges in groundwater vulnerability assessment using overlay and index methods", Environmental Geology, 39(6), 549-559. Khosravi, Kh., Habibnezhad, M., Soleimani, K. & Babei, Kh., 2012, "Assessing vulnerability of groundwater using DRASTIC model in GIS (Case study: Dehgolan plain, Kordestan Province)", Journal of Watershed Management, 3(5), 41-62. Lodwick, W. A., Monson, W. & Svoboda, L., 1990, "Attribute error and sensitivity analysis of map operations in geographical information systems: Suitability analysis", Journal of Geographic Information of Systems, 4(4), 413-28. Napolitano, P. & Fabbri, A. G., 1996, "Single-parameter sensitivity analysis for aquifer vulnerability assessment using DRASTIC and SINTACS", HydroGIS 96: Application of Geographical Information Systems in Hydrology and Water Resources Management, Proceedings of Vienna Conference, IAHS Pub., 235, 559-566. Ott, N., Kollersberger, T. & Tassara, A., 2006, "GIS analyses and favorability mapping of optimized satellite data in northern Chile to improve exploration for copper mineral deposits", Geosphere, 2, 236-252. Rosen, L., 1994, "A study of the DRASTIC methodology with emphasis on Swedish conditions", Ground Water, 32(2), 278-285. Sener, E, & Davraz, A., 2012, "Assessment of groundwater vulnerability based on a modified DRASTIC model, GIS and an analytic hierarchy process (AHP) method", Hydrogeology Journal, 21(3), 701-714. Vrba, J. & Zoporozec, A., 1994, Guide book on mapping groundwater vulnerability, International Association of Hydrogeology, Hannover Heise.